Continuing our Before & After series, for this installment we go to Penthouse Dabbs on the top floor of a small apartment building in the Cape Town city bowl suburb of Tamboerskloof. 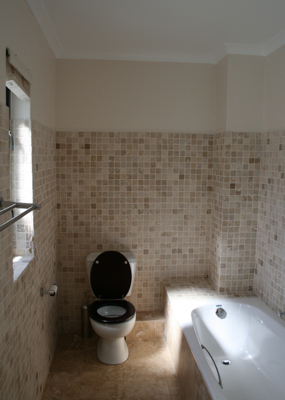 The owners had recently purchased the two-bedroom flat and were renovating throughout. 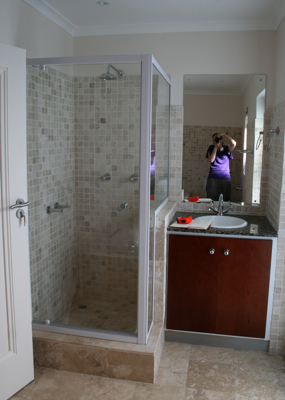 Bespoke Bathrooms was contracted by the clients for our specialist knowledge and experience. We found a fair-sized main bathroom with one window and some natural light but the room was long and narrow and poorly laid out. The finishes were nothing special and there was only basic overhead lighting. 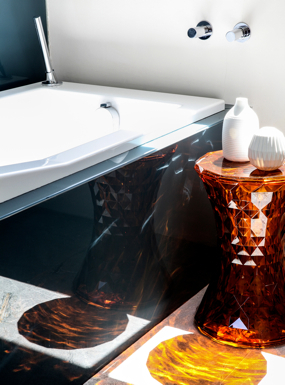 The space lacked storage and the vanity and basin were in an awkward position. We decided to use a smaller by deeper bathtub and placed it against one of the narrow walls rather than along the length of the room. This freed up space and meant we could shift the basin into a more central and user-friendly position with in-built storage. Along the wall where the bathtub had been we had space for a bidet and WC, both wall hung. A glass shelf above these provides display and extra storage space too. 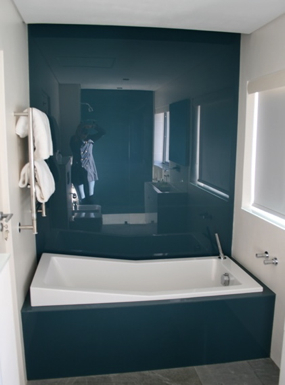 On the wall opposite the bathtub we installed a large walk-in shower with a custom aqua slab shower tray. 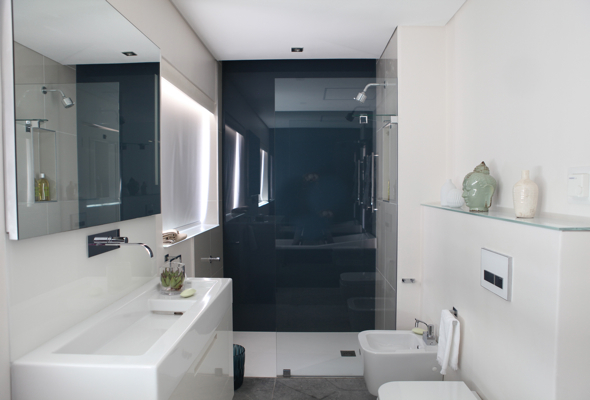 The two shorter walls are clad in grey-black painted glass, giving a wonderful dramatic effect to the space as a whole. By using grey glass granite flooring and simple LED lights we could integrate the look of the three planes – floor, walls, ceiling. We were also able to install a second window which brings in more light and views thereby making the space feel less like a long gallery.